It’s been the standard mantra of The Legal Genealogist from the outset. And not just the law in some sort of generalized fashion, but the law at the exact time and in the exact place where the record was created. So, in anticipation of this weekend’s seminar of the Ventura County Genealogical Society, I set out to look at the law in Ventura County, California. And ran right into the need to find out more about the history of Ventura County, California. Because, until really quite late in California history, there wasn’t a Ventura County. California was first settled by Anglo immigrants after Spanish missionaries arrived there in the late 1600s. So it has a long and rich history. In 1697 the Jesuit missionary Juan María de Salvatierra established Misión de Nuestra Señora de Loreto Conchó, the first permanent mission on the Baja California Peninsula. Spanish control over the peninsula, including missions, was gradually extended, first in the region around Loreto, then to the south in the Cape region, and finally to the north across the northern boundary of present-day Baja California Sur. A total of 30 Spanish missions in Baja California were established. During the last quarter of the 18th century, the first Spanish settlements were established in what later became the Las Californias Province of the Viceroyalty of New Spain. Reacting to interest by the Russian Empire and, later, Great Britain in the fur-bearing animals of the Pacific north coast, Spain further extended the series of Catholic missions, accompanied by troops and establishing ranches, along the southern and central coast of California. These missions were intended to demonstrate the claim of the Spanish Empire to what is now California. By 1823, 21 Spanish missions had been established in Alta California. Operations were based out of the naval base at San Blas and included not only the establishment and supply of missions in California, but a series of exploration expeditions to the Pacific Northwest and Alaska. And throughout that entire history — from the first Spanish settlers through early statehood — there wasn’t a Ventura County. Where do we go when we need to know about this sort of thing? To determine what counties existed when, what the county lines were, how the boundaries changed? There are some terrific resources out there, with one of the very best being the Atlas of Historical County Boundaries at The Newberry Library in Chicago. Despite the fact that its interactive map feature is still offline, having gone offline in the summer of 2015,5 the site is still one of the best research resources for county boundary information. For every state, the Atlas offers an index of counties and equivalents, a consolidated chronology of state and county boundaries, individual county chronologies and bibliographic information for more research. In the meantime, if you (like me) learn more effectively through a visual presentation, there are interactive maps online. 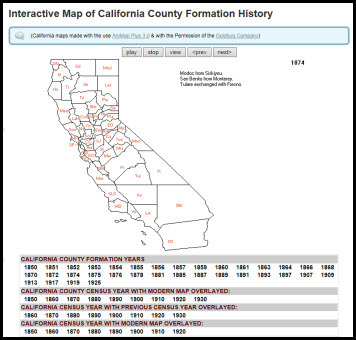 Another source is MapofUS.org, a website where you can find county formation maps for every state, created with the software AniMap Plus 3.0 — and, of course, with the permission of the Goldbug Company, publisher of the software. Be aware that you may need to use Internet Explorer rather than another browser, and need to tell the browser to show all content before the map feature will work properly, but there, you can see what California looked like in 1850, when it became a state — and what it looked like in 1874, after Ventura County was created. Bottom line: finding the law at the time and the place always means starting with understanding the place. I am not affiliated with with this site and receive no renumeration for recommending it.